MES Forschungssysteme GmbH, Brain Products’ distributor for Germany and Switzerland, has recently taken over the distribution of the worldwide-used pain stimulator devices of the company MEDOC (Ramat Yishai, Israel). MEDOC offers a variety of solutions to test thermal, vibrational, pressure sensitivity and pain for researchers (also in MRI environment) as well as for clinical applications (with portable machines and normative data). Different pain conditions are the most frequent reason for consulting a physician, missing working days or feeling disrupted in our daily life. For example, a frequent pain-related condition, the chronic neuropathic pain, characterized by primary lesions or dysfunction of the central or peripheral nervous system (Colombo et al., 2006), affects over 15 – 20 million people just in the United States. The costs of treatment and the individual suffering caused to the patients make it extremely important to research pain-related phenomena and to understand the functioning and persistence of these symptoms. MEDOC provides products, which are specially designed for research applications, such as Pathways and TSA-II and also offers portable devices for diagnostic purposes such as Q-Sense and AlgoMed. One broadly-used method with MEDOC devices is Quantitative Sensory Testing (QST), which aims to characterize the somatosensory functioning or dysfunctioning with the assessment of perceptual and physiological responses to a systematically applied and quantifiable sensory stimuli (Rolke et al., 2006a, Cruz-Almeida & Fillingim, 2014). The most frequently used QST protocols, such as the protocol of the German Pain Society (Rolke et al., 2006b) consists of thermal sensory testing along with a variety of other tests to assess mechanical sensation, mechanical pain threshold, pain summation (wind-up ratio), vibration detection and pressure pain threshold. Mechanical pain sensation and threshold is measured with a set of pinpricks that a trained user applies on the participant’s skin with the same force and for the same duration. Wind-up ratio is calculated based on the effect caused by repeated application of the same pinpricks. Vibration is measured with a Rydel-Seiffer graded tuning fork, which is placed over bony prominence, while pressure is measured with a hand-applied algometer. As it is clear from the above mentioned methods, the experimenter needs to be well-trained in order to get comparable data. 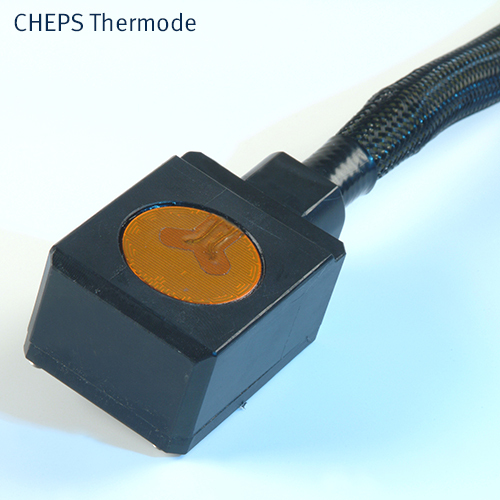 However, the thermal sensation testing is carried out by a contact thermode based on a Peltier element (TSA-II) or on air ventilation (Q-Sense and Q-Sense CPM) and the results are registered in a designated software, which allows the user to create their own paradigms. The real novelty of the MEDOC systems lies in the dedicated and user-friendly software (MEDOC Work Station), which reduces dramatically the differences originating from the differences among the experimenters. This stability in the thermal tests makes the thermal QST a plausible tool in research and diagnosis. By applying ascending and descending ramps of temperature we can reliably test the heat and cold sensation and pain thresholds, and the functioning of the A delta and C primary afferent fibers. Besides peripheral changes caused by the pain, the complete pain pathways and the functional changes in the brain are also of high interest. 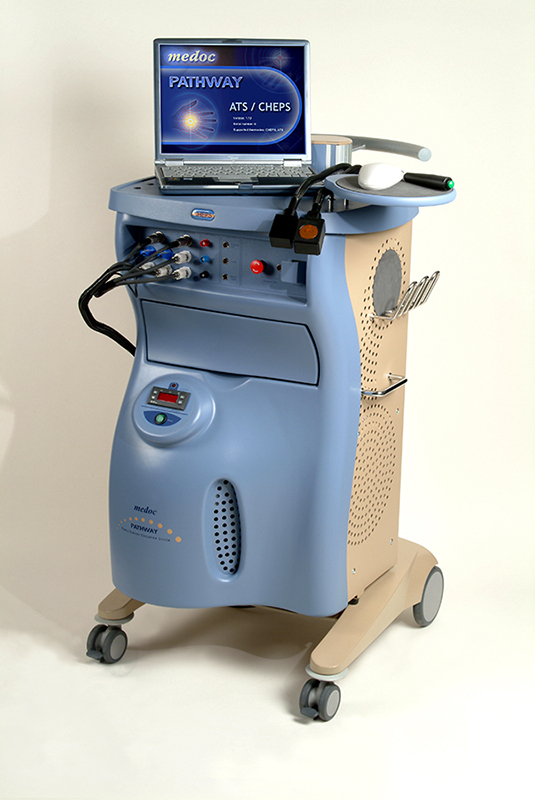 Till the early 2000s the only way to examine pain-related potentials was laser-evoked pain stimulation (LEP). Apart from its accurate timing this method has some disadvantages, among them possible cutaneous lesions, required safety measurements and restricted stimulation area. Recently, several studies showed that contact heat-evoked potentials (CHEP) are a reliable and reproducible way of measuring pain-related evoked potentials by stimulating different body parts (Chao et al., 2008). With the combination of MEDOC thermodes (Pathways model CHEPS) and Brain Products EEG systems it is possible to induce and measure precisely pain-related evoked potentials from the scalp, even in scanner environment. CHEPS are physically very similar to the LEP stimulation as they both activate the same types of nociceptors that express TRPV1 receptors (Baumgärtner et al., 2012). CHEPS stimulation is followed by the same relative cortical sequence as the LEP stimulation, scalp surface mapping and dipole source analysis suggest similar generators in the operculo-insular cortex as for LEPs (for review see Garcia-Larrea et a., 2003). The ideal recording setup for CHEP is identical to that of the LEP (Treede et al., 2003): the main N2-P2 component is performed at Cz (against linked earlobes and EOG control). The earlier N1 response is measurable on T7/T8 with a frontal reference (Fz). The latency of the CHEP is usually delayed 100 ms after stimulation of the face and 150 – 300 ms after stimulation of the extremities compared with LEP latencies (Baumgärtner et al., 2012). One difficulty of the CHEPS measurements to overcome is the decreased amplitude of the N2-P2 complex due to habituation. One possibility to handle this effect is to slightly reposition the probe after every 5-10 stimulation points or to use single-trial averaging (Warbrick et al., 2011) with a fixed stimulation position. In summary, the MEDOC thermodes are appropriate tools for assessing the integrity of the ascending pain pathways, especially the A delta and C fibers. Joint measurements with the Brain Products EEG systems are helpful for researchers, who aim to have an objective measurement of pain perception or to evaluate the dynamic changes of the pain sensation after experimental manipulation or pain treatment. Baumgärtner, U., Greffrath, W., Treede, R. D. (2012). Contact heat and cold, mechanical, electrical and chemical stimuli to elicit small fiber-evoked potentials: merits and limitations for basic science and clinical use. Neurophysiol Clin. 42(5), 267-80. Chao, C. C., Hsieh, S. C., Tseng, M. T., Chang, Y. C., Hsieh, S. T. (2008). Patterns of contact heat evoked potentials (CHEP) in neuropathy with skin denervation: correlation of CHEP amplitude with intraepidermal nerve fiber density. Clin Neurophysiol. 119(3), 653-61. Colombo, B., Annovazzi, P. O., Comi, G. (2006). Medications for neuropathic pain: current trends. Neurol Sci. 27(Suppl 2), S183–9. Cruz-Almeida, Y., Fillingim,R. B. (2014). Can quantitative sensory testing move us closer to mechanism-based pain management? Pain Med. 15(1), 61-72. Garcia-Larrea, L., Frot, M., Valeriani, M (2003). Brain generators of laser-evoked potentials: from dipoles to functional significance. Neurophysiol Clin. 33, 279-92. Rolke, R., Baron, R., Maier, C., Tölle, T. R., Treede, R. D., Beyer, A., Binder, A., Birbaumer, N., Birklein, F., Bötefür, I. C., Braune, S., Flor, H., Huge, V., Klug, R., Landwehrmeyer, G. B., Magerl, W., Maihöfner, C., Rolko, C., Schaub, C., Scherens, A., Sprenger, T., Valet, M., Wasserka, B. (2006b). Quantitative sensory testing in the German Research Network on NeuropathicPain (DFNS): Standardized protocol and reference values. Pain. 123, 231-43. Rolke, R., Magerl, W., Andrews Campbell, K., Schalber, C., Birklein, F., Treede R. D. (2006a). Quantitative sensory testing: a comprehensive protocol for clinical trials. Eur J Pain. 10, 77-88. Treede, R. D., Lorenz, J., Baumgärtner U. (2003). Clinical usefulness of laser-evoked potentials. Neurophysiol Clin., 33, 303-14. Warbrick, T., Derbyshire, S. W., Bagshaw, A. P. (2009). Optimizing the measurement of contact heat evoked potentials. J Clin Neurophysiol. 26(2), 117-22.